Thank you for the excellent service. The great food, the wonderful atmosphere. 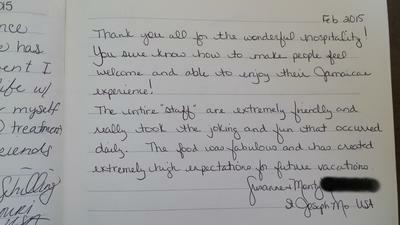 We truly enjoyed our stay.We couldn't ask for anything more. 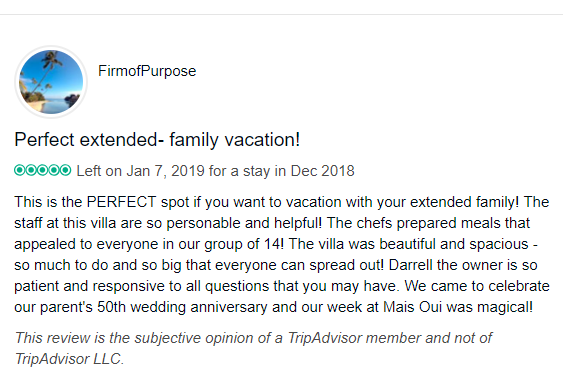 Mais Oui was beyond our expectations - a beautifully decorated mansion with grand amenities and a staff that met our needs graciously. We appreciate very much the opportunity for twelve of us to gather here for Christmas and an amazing Caribbean experience. This week has been the best. You've made me feel special. You all have a class act. The cook, Mr. "O" I could take you home with me, and Shane you are the best. Max, you didn't go unnoticed, and the ladies you were awesome. Thank you so much for making my birthday week the best. Much love. Much respect! A most enjoyable stay at Mais Oui Villa! Your team is exceptional, thoughtful and fun!! Our meals were fabulous! Delicious and 6 * * * * * * stars awarded! 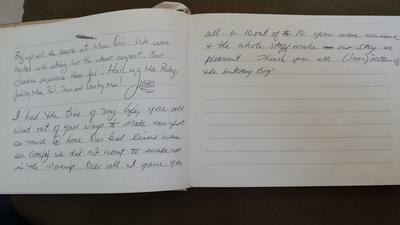 We felt spoiled by the staff and as comfortable here as in our own home. From Delicious meals to individualized service, Mais Oui gave us a vacation to remember. We were thrilled the little little christmas tree out side caught Santa's eye. E. W. and A. M.
We just got back from the best multi family vacation we ever had. 3 families. 7 adults 9 kids. Everyone is own beds throughout 8 bedrooms. Big clean a/c rooms all with own baths and balconies. House was amazing. Pool, jacuzzi, spa, gym, pool table, ping pong table, foos ball table, giant chess board, frisbee golf, video games, roof top movie theatre, kayaks, pool and beach toys and tennis court. Endless activities. Food was incredible. Lobster, king crab, shrimp, conch, fish, filet mignon, jerk chicken. India tai Chinese Mediterranean and especially Jamaican. I fed my family of six for 150.00us a day. Unheard of anywhere. Best value ever. 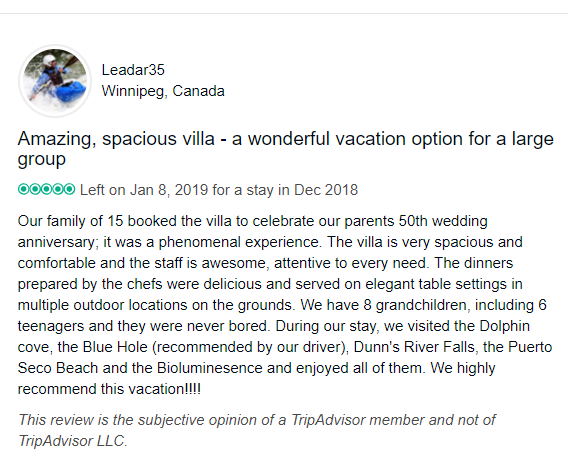 We usually do 5 star all inclusives but food always a let down. Not at Mais oui. The staff was incredible. They work very professional and very hard. Best chef oret and best bartender and server Kevin and concierge driver dave. Thank you all for all you did. Wish I could list some negatives but it was exactly as advertised. Darrel thanks for everything. You made it the easiet vacation we've ever had. Great value for 14 days. Can't wait to come back. If anyone wants more info from me Darrel and put us in touch. Cheers to all. And thanks for a vacation we will never forget. This villa was spacious, beautiful and clean. All of the staff members were really helpful and sweet. The food was AWESOME. I thought this was better than staying at a resort because of the personalized attention, and my kids loved having the pool all to ourselves. I have to mention the spa services were exceptional as well!! I will return!! 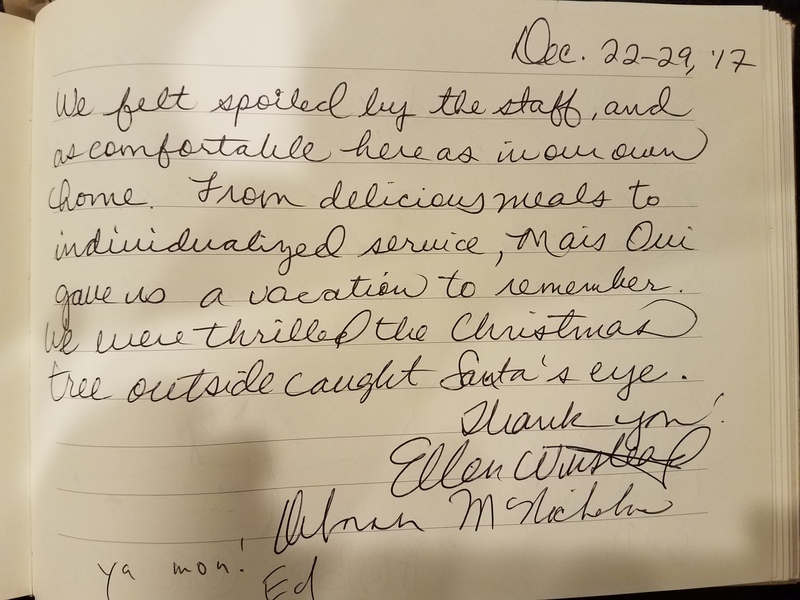 The Mills Family writes . . .
We wish to say a big "Thank you" for making our vacation/family reunion so enjoyable. We sincerely appreciate all the amazing care you have given us. If #10 is the best then you all deserve a #12! Sincerely, The Mills Family and all of us. We enjoyed a wonderful week at this exceptional property, located on a very pretty bay approximately 60 minutes drive from Montego Bay. We were 18 in total for a family holiday, including 8 pre-teens. The accommodations are very high class and there was lots of space for everyone. The many public rooms provided space for all kinds of games as well as quiet places to read and chat. The pool and hot tub, as well as the tennis court, sea kayaks and basketball court were all well used. The steam room and spa massage service were enjoyed by the ladies. A hundred yards away, a small beach was very private and provided hours of snorkeling, swimming, beach combing and swinging activity. Most sports equipment was provided. I had the time of my life, you all went out of your ways to make us feel so much @ home. Our bed linens were so comfy we did not want to wake up in the mornings. Over all I gave you all a 10 out of 10. 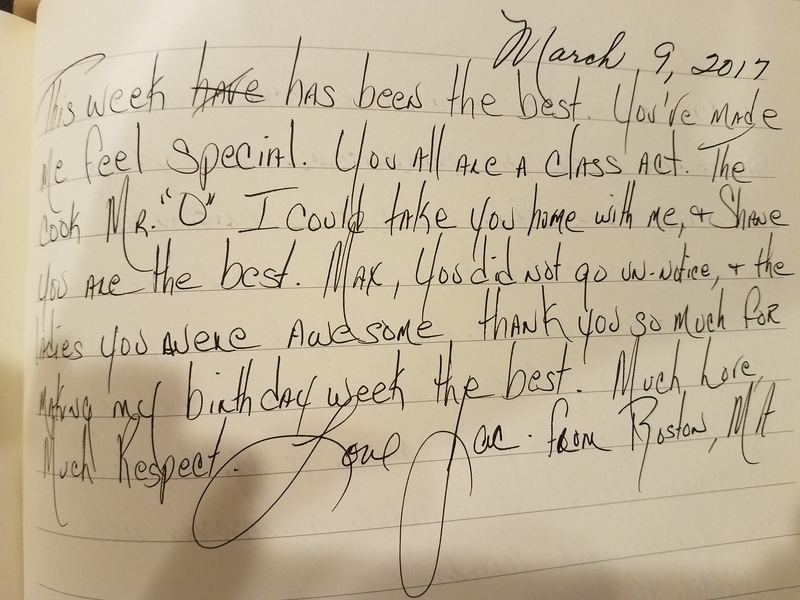 You were awesome and the whole staff make our stay so pleasant. (Joan) "Mother of the birthday boy"
I stayed at the Mais Oui Villa from 1/17 - 1/24. After a long day of travel, customs, and the chaos of a large group, I was pleased to see the staff of the Mais Oui greeting us at the villa with cool drinks and cool towel to wipe our brow. 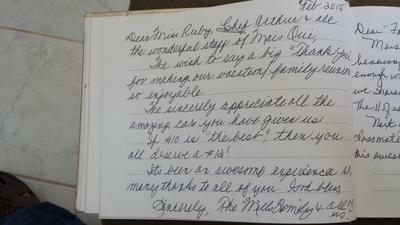 Miss Ruby and her team were professional and accommodated our every need. Dave the driver, was very polite and, most knowledgeable regarding the island. The Chef provided a fabulous variety of island favorites for every meal. The rooms were immaculate and well maintained. The grounds are secure and there is a private pool surrounded by the building. There are countless locations both public and private to relax or (if needed) work on your tan. The staff constantly ask if there is anything you need (a good thing). At the end of the evening, they retire to their on-premise lodging for the night. 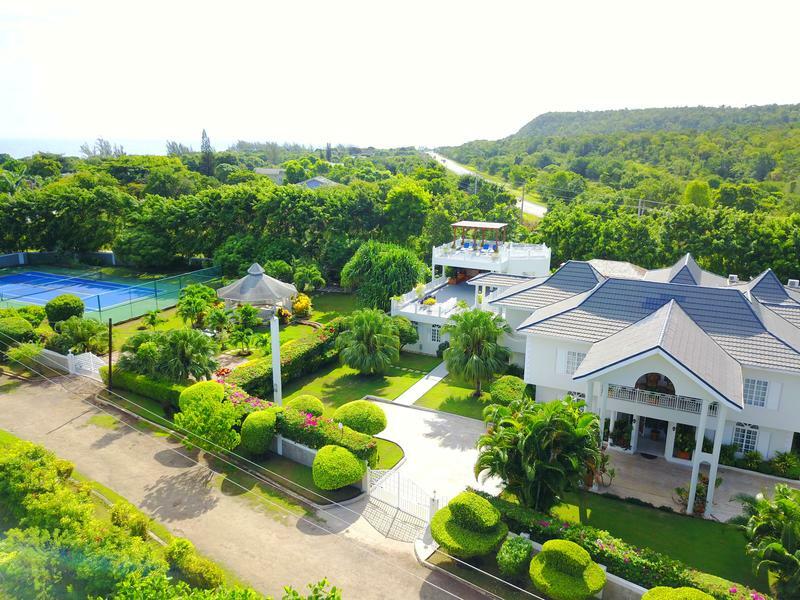 The property is located on a private road, near a secluded beach area. Just up the road is another private beach which is staffed and accommodates visitors to Mais Oui Villa. There are many exotic plants and fruit trees on the property as well as a gazebo surrounded by a small pond. The property is located near the main road so occasional road noise will be heard however, this is infrequent. Thank you all for the wonderful hospitality! 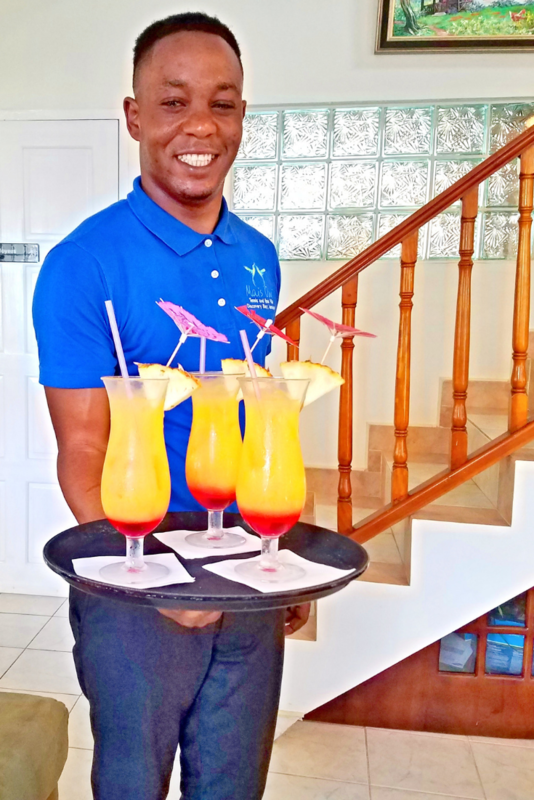 You sure know how to make people feel welcome and able to enjoy their Jamaican experience! The entire "staff" are extremely friendly and really took the joking and fun that occurred daily. The food was fabulous and has created extremely high expectations for future vacations! Our stay at Mais Oui was quite simply exceptional. The villa is lovely, the pool wonderful, the private beach quaint, and the staff extraordinary. 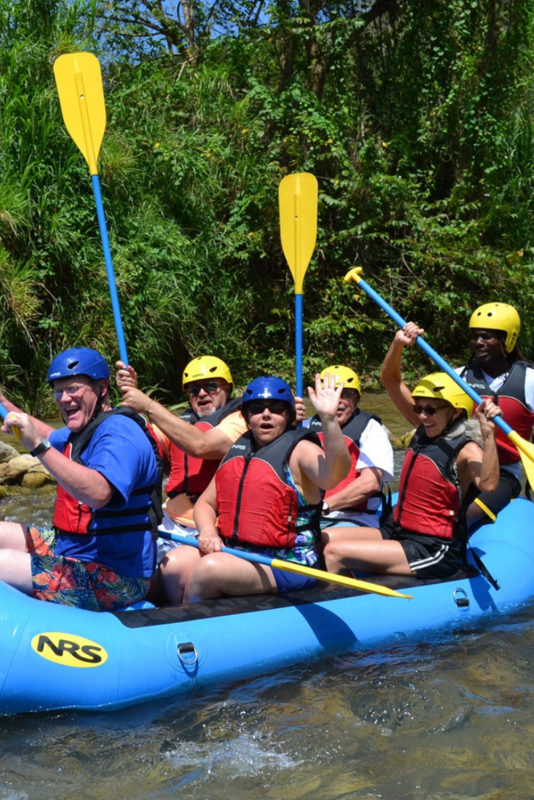 The location is perfect as you have easy access to activities in Ocho Rios and Montego Bay. We had a large family celebration of my parents' 50th anniversary, and the villa offered comfort and plenty of room to spread out. Having a driver was incredibly helpful. I can't recommend the wonderful vacation spot enough! Thank you so much for your warm reception, attentive service, joyful atmosphere, and for providing us a glimpse of the culture, taste and spirit of Jamaica. This was my first time on the island, and because of your wonderful introduction, it won’t be my last. 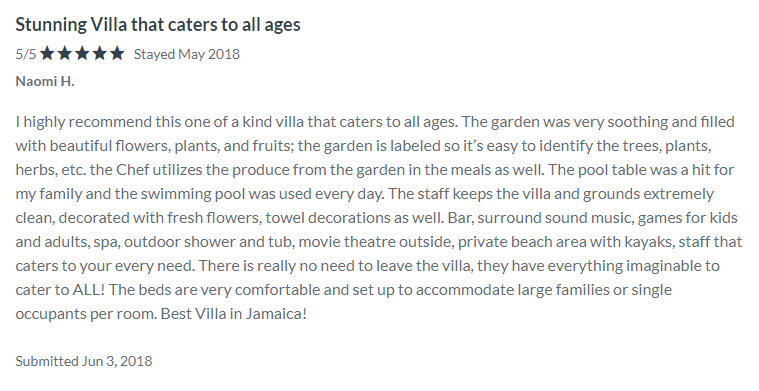 I had high expectations for our family vacation in Jamaica - and the staff at Mais Oui not only met every one of them but exceeded them beyond what I could have imagined. Thank you so much for treating my family like your family. Our experience here is one that I will treasure always. One word describes our ultimate stay at Mais Oui - "wow". The villa grounds and house are fabulous. Miss Jennifer, Dave, and Raymar were very attentive to all our needs. Darrell's coordination was excellent. The villa was so much more than our expectations. Our grandsons loved the tennis court and we all took advantage of the work-out room and massages. Looking forward to our next visit. 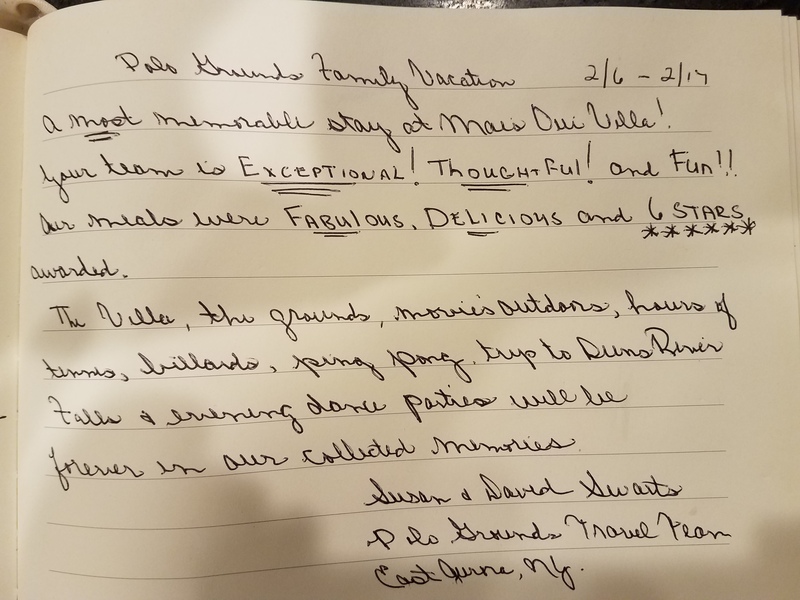 My adult daughter and I spent a wonderful week at Mais Oui. The setting, amenities, staff and food were perfect. We were s-o-o-o relaxed. The staff was so flexible, and personable. They set up extras for us, and special day trips, including our very safe driver. I would return anytime!